Red Arrow Pool House - Brand New 3 bedroom single family pool home with fire pit. Property Size 1,890 sq. ft. Welcome to Red Arrow Pool House, a beautiful completely updated farm style house. Three bedrooms, three full baths and fenced in ground pool with solar cover make this perfect family get-away. Lots of details and designer touches throughout. The large yard is enclosed by fence (other that the driveway) and has a fire pit and plenty of yard space. The property is surrounded by trees and fencing (other than the driveway) to create the feeling of a beautiful farm house in the country. You can sit on the wrap around deck, or gather around the fire pit and watch the kids while they are in the pool. Being centrally located to Harbor Country makes this retreat a great location to experience the area. 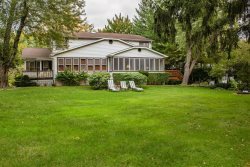 Close to downtown Sawyer, Greenbush Brewery and Warren Dunes State Park (which is the closest beach access) yet just a short distance to New Buffalo.